Fulton Lions Robert Reynolds, left, and Leo Chirello were recent participants in Honor Flight Syracuse Mission 009 to Washington, D.C. Honor Flight paid all expenses for the trip which included visits to the WWII, Korean, Vietnam, and Air Force memorials, Arlington National Cemetery, and a rousing heroes welcome at Syracuse’s Hancock International Airport on their return. 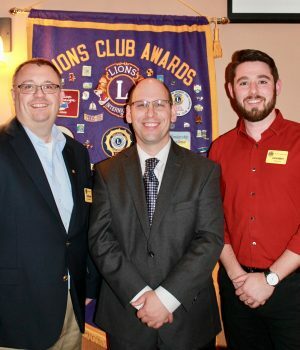 FULTON, NY – Joseph Fiumara, center, executive director, Fulton Community Development Agency, made a presentation at at the Fulton Lions club’s March meeting. Fiumara elaborated on waterfront development plans for Lake Neatahwanta, improvements to Recreation Park, and progress made by the Fulton Footpaths organization. 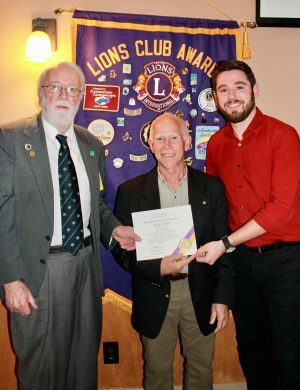 Joining him is Fulton Lions President Dave Guyer, left, and Fulton Lions Past President Robert Weston, who is also a member of the Local Waterfront Revitalization Committee. The Fulton Lions Club, also known for their Lions Loot Sweepstakes, Lions Mane Event Comedy Night, and annual Duck Derby, provides financial assistance for those in need of eyeglasses, eye exams, and hearing aids to residents in the Greater Fulton area. FULTON, NY – Author Jim Farfaglia and Mary Kimball made a presentation to the Fulton Lions Club on their book, “The Heart of Fulton at Home and Abroad: World War II and the Korean War,” at the club’s February meeting. From left are: Jim Farfaglia, Leo Chirello, Mary Kimball and Dave Guyer. Kimball and Farfaglia read excerpts from the book, which recounts personal stories of Fulton veterans and their families during the two wars. Fulton Lions past president Leo Chirello is a Korean War veteran who contributed a memoir to the book. They were joined by Fulton Lions President Dave Guyer. The Fulton Lions Club, also known for its Lions Loot Sweepstakes, Lions Mane Event Comedy Night, and annual Duck Derby, provides financial assistance for those in need of eyeglasses, eye exams, and hearing aids to residents in the Greater Fulton area. Find them on Facebook under Fulton, NY Lions. FULTON, NY – The Fulton Lions Club recently donated $1,000 to Fulton Block Builders. From left are: Dave Guyer and Linda Eagan. Guyer is shown with Linda Egan, FBB administrative director. 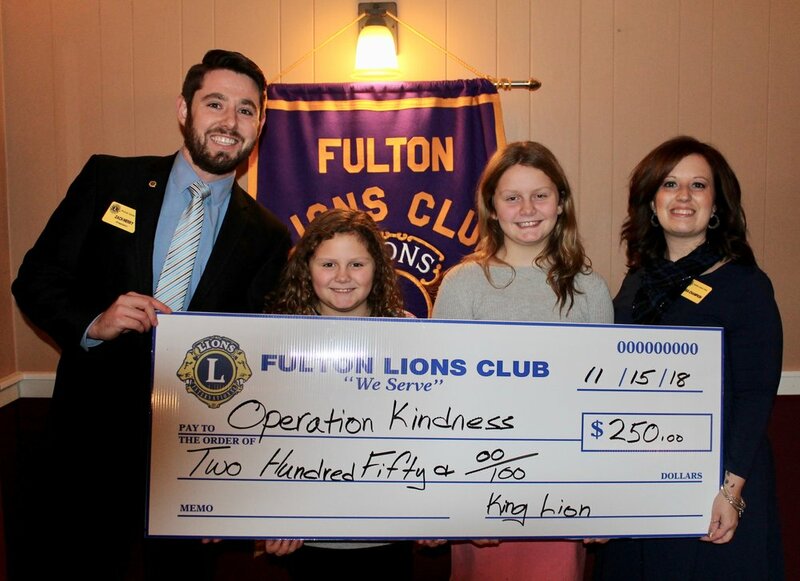 Fulton’s Lions Club, also known for its Lions Loot Sweepstakes, (April 30) and Lions Mane Event Comedy Night, provides financial assistance for those in need of eyeglasses, eye exams, and hearing aids to residents in the greater Fulton area.